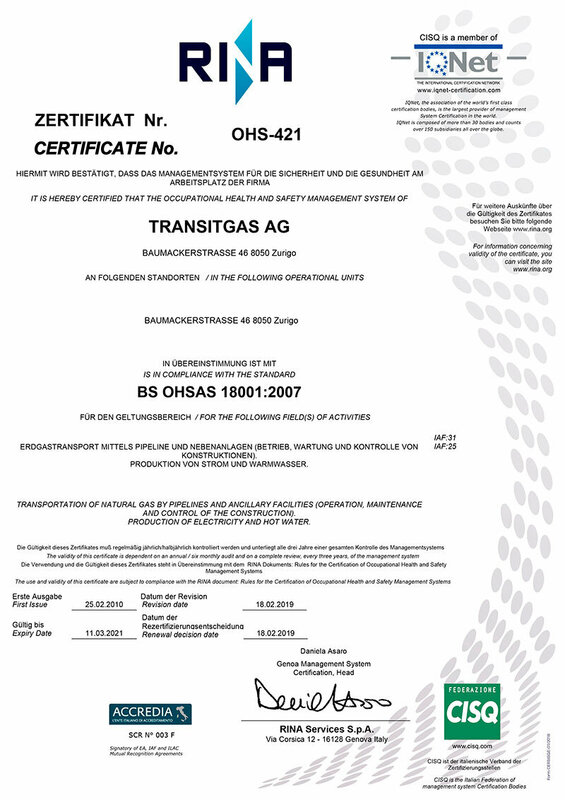 Transitgas AG has an integrated management system for HSE (Health, Safety and Environment) in place and has been certified according to internationally recognised standards, namely OHSAS 18001 (Occupational Health and Safety) and ISO 14001 (Environmental Management), since February 2010. The certification demonstrates that the company meets all the requirements of the legal regulations and corresponding standards. 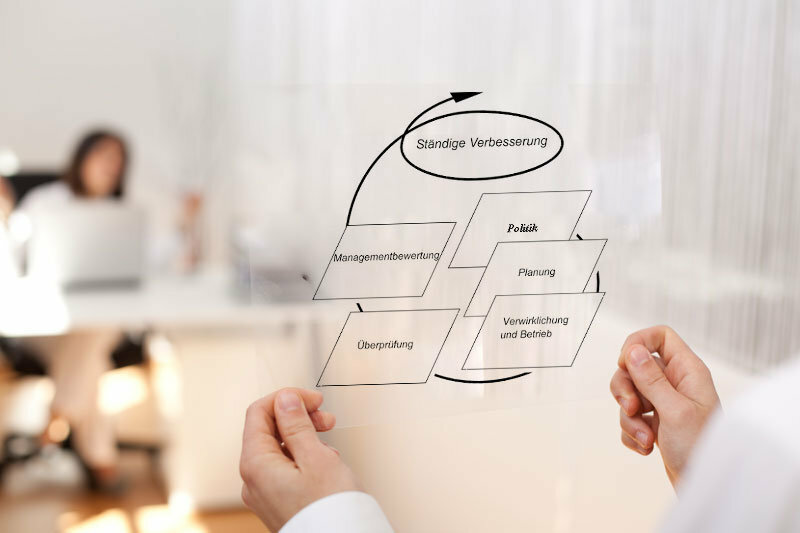 This company management system enables all company activities to be better understood, controlled and improved from the point of view of health and safety of personnel as well as possible effects on the environment. 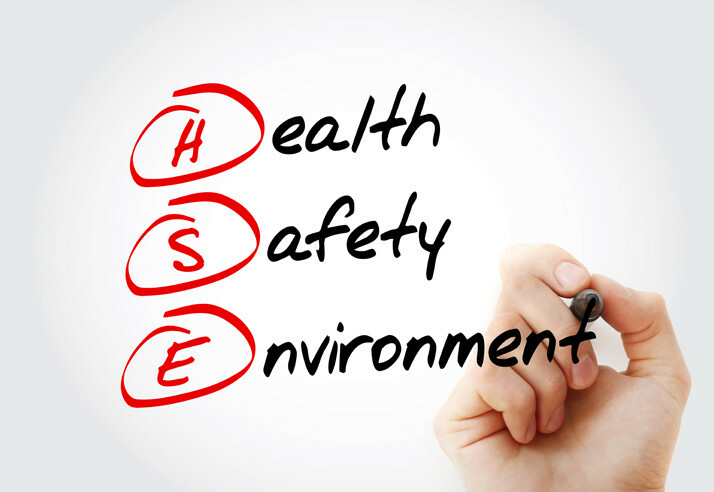 The HSE management system is a way of life for the complete workforce and has passed every control audit. The special steel pipes used for the construction of the Transitgas pipeline meet the strict requirements of present day technical regulations. Before commissioning, the individual sections of the pipeline were subjected to strict quality and leak testing. Careful inspection and maintenance of pipes and plant guarantee compliance with the high standards of operating safety. The condition and integrity of the pipeline is tested using a complex electronic device, the so-called intelligent pig. It is passed through the pipeline using the gas flow and detects invisible defects in the walls of the pipe for example. The good relations between Transitgas AG and all landowners affected by the natural gas pipeline significantly simplify monitoring and preventive maintenance. Particular attention is paid to the pipeline route. It is regularly inspected by vehicle and on foot, in order to identify potentially dangerous situations in good time. The pipes are fitted with an insulating cover as a passive corrosion protection. In addition, they are actively protected against corrosion by a cathodic corrosion protection system in case of damage to the pipe insulation. Monitoring of the cathodic corrosion protection is carried out using electrical control measurements along the whole of the route and within the stations. 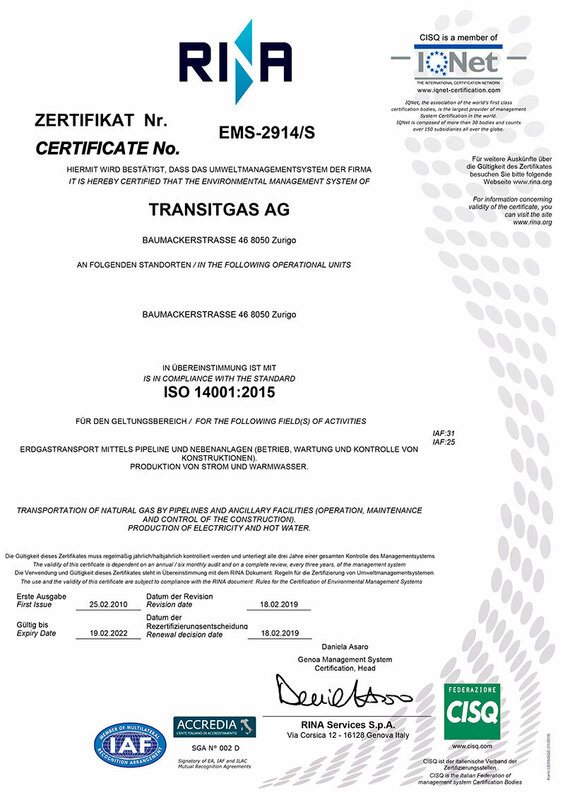 As a result of the installation of an extra slide-gate valve station at Transitgas AG’s initiative, in conjunction with the major expansion, the safety standard of the transport system was additionally increased. 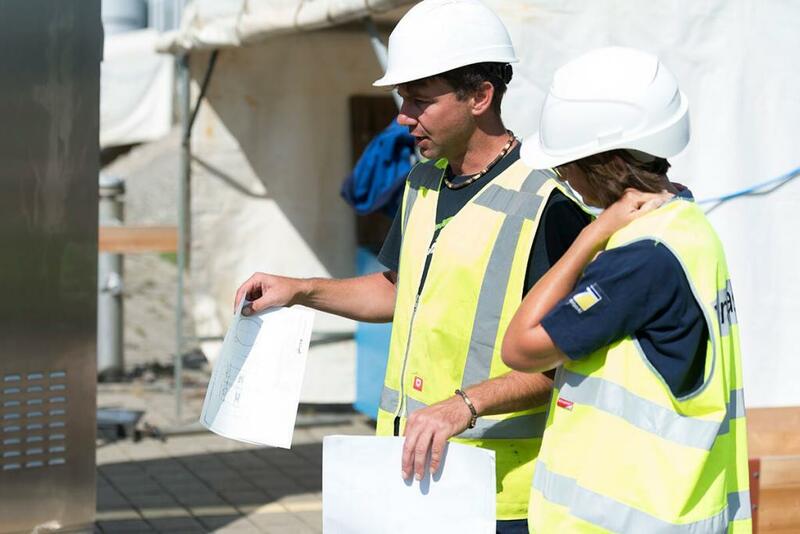 In addition to strict compliance with statutory regulations, Transitgas AG makes every effort to safeguard the health and safety of its employees. That is achieved through measures including training and further education, as well as internal and external audits.